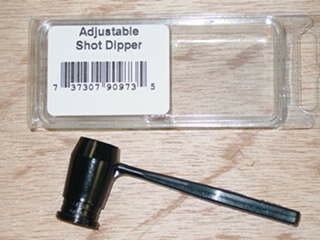 Lee Adjustable Shot Dipper accurately measures lead, bismuth and steel. Telescoping cup adjustable from 7/8 oz to 1 7/8 oz. Calibrated for lead shot. Works perfect for large pellet sizes. With steel, simply count out the pellets or weigh and set dipper accordingly. WARNING: Handling lead shot will expose you and others in the area to lead, which is known to the State of California to cause reproductive harm and cancer. For more information, go to www.P65Warnings.ca.gov.